Get ready for a night of upbeat melodies and intoxicating rhythms, when The West End Sessions returns next month with bluegrass favourites The Company, and folk rockers Tin Star. Hosted by the West End Uniting Church, The West End Sessions is renowned for its impressive year-to-year line-up of local and international touring musicians and sonic display of world music styles. Previous acts who have graced the historical stage of the United Church include The Verandah Chix, Kristy Apps, Chanel Lucas and The Barleyshakes, just to name a few. This is a family friendly, alcohol-free event and dinner will be provided in exchange for a gold coin donation, with all profits going to the artists performing. ALL AGES (with an adult supervisor), alcohol-free. Described as “a masterclass in bluegrass”, The Company bring an eclectic and smooth set of soulful melodies to every dancing ground they perform for, funnelling everything from traditional bluegrass to virtuosic compositions. The band features two Au stralian Bluegrass idols on guitar, fiddle and banjo, with the group delivering nothing less than an exuberant and high-energy selection of traditional acoustic music and crisp vocals. 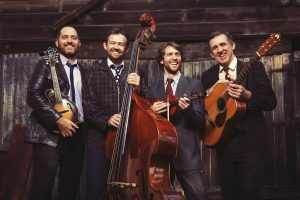 The Brisbane-based four piece, comprised of Mick Patrick (Vocals/Mandolin/Fiddle), Jamie Clark (Guitar/Vocals), George Jackson (Fiddle/Banjo) and Markus Karlsen (Double Bass/Vocals), have made an indelible impact on the Queensland and national acoustic country scene, with their third critically acclaimed album, Six & Five also featured as ‘Album of the Week’ on ABC’s Saturday Night Country. The Company officially launched Six & Five on November 5th, 2016 and have toured extensively throughout Australia an New Zealand since its release. Based in Brisbane, Tin Star blend together traditional folk tendencies with rock and roll and includes members Penny Boys (Vocals, Guitar), Cathy Bell (Fiddle, Accordion, Harmony Vocals) and Dan Grant (Vocals, Guitar). Evocative melodies and powerful vocals are blended together to create sounds reminiscent of the burgeoning folk scene of 60’s New York and California, forging an intimate space which is both charming and blissful. Tin Star will also be performing later this year at the Maleny Music Festival and Turning Wave Festival in Yass, NSW.